Mary Novaria : Scrabble, we have a problem. Scrabble, we have a problem. UPDATE: Friday, October 24. It has now been three days since EA has posted an update on the Network Error to either Facebook or Twitter. Let's continue to keep the pressure on for a fix! Comment on the Scrabble Digital Facebook page or Tweet @SCRABBLE_EA Many of us paid for this app and we deserve answers and a refund. The latest--October 21. Day 6. Not "favoriting" this... iOS users are still SOL. Update--October 20. Yesterday, EA reported the following via Facebook and Twitter: "Hello everyone. Scrabble for Google Play has been updated with the fix to the Facebook connect issue. You can download the latest version in the Google Play store now. We're continuing to work the iOS and Amazon versions. Thank you again for your patience." In other words, those of us playing on Apple devices are still hostages to this network terror, er, error. As Sean McAleer commented below: "In my mind, I'm hearing Ted Koppel's voice saying something about Day 5 of America's Captivity." What the Scrabble app dubs a “network error” has become a network TERROR for legions of wordsmiths who are suffering serious withdrawal as a glitch between Electronic Arts (EA) and Facebook enters Day 3. EA is the entertainment software company that delivers Scrabble and hundreds of other games to phones, tablets and computers. 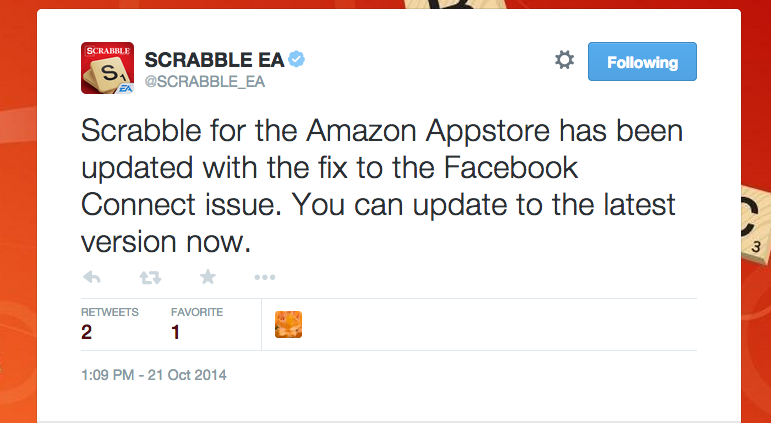 “The addicts are getting antsy!” one user commented on EA’s Scrabble Digital Facebook page. “I N E E D M Y F I X ! ! !” posted another. “Scrabble withdrawal worse than drugs… please fix it soon,” wrote a Frenchwoman, summing it up for hundreds of the game’s 950,000+ fans who are irritable and vocal. It’s especially aggravating if one has paid for the app as a way to circumvent annoying advertisements. Okay, so admittedly this is a first-world problem. Clearly there are other more important issues du jour… like Ebola and ISIS and the mid-term elections. But those are exactly the reasons Scrabble games and Facebook in general give some relief to the masses. Paradoxically, they are a way to both escape and stay connected. Lots of us play Scrabble and do crosswords as a way to keep our minds sharp, hedging our bets (fingers crossed) against future cognitive impairment. The game also provides a quick getaway from the day-to-day drudge and angst of unfulfilling jobs, bad news and personal problems. And, while using Scrabble’s chat function, we can communicate daily with loved ones—it’s how I stay in touch with my brother and a small handful of friends who, like me, enjoy the challenge of a good game along with a quick check-in. As the old adage goes, Misery loves company, so in the meantime, Scrabble users with DTs can at least commiserate via social media… and there’s always Words with Friends. Oh noooo! I would be so upset. I play Words With Friends because I paid for the no-ad version and I would be so upset if there were problems with my iPad. I wish you and the fellow sufferers a quick resolution. Thanks, Mary. 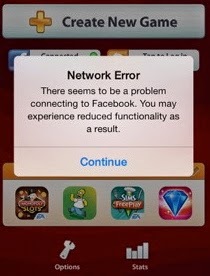 Yes, when we pay for an app it's especially frustrating when it doesn't work! As an avid Scrabble player I am experiencing major withdrawal systems .. Still no sign of a fix. Will have to move on to Words With Friends. Fingers crossed for a fix... they've put up they're daily "still working on it and sorry" update... Can't help but wonder if they've just assigned the problem to an intern. Still no update from EA and it's been, what, 6 days now? Paying $10 for a game that doesn't work is annoying at best. They've had a couple of very unsatisfying updates... not much info and no ETA on when this will be resolved. Stay strong! Thanks for great blog really nice . for more you can check my link below . we have great experience in apps development . 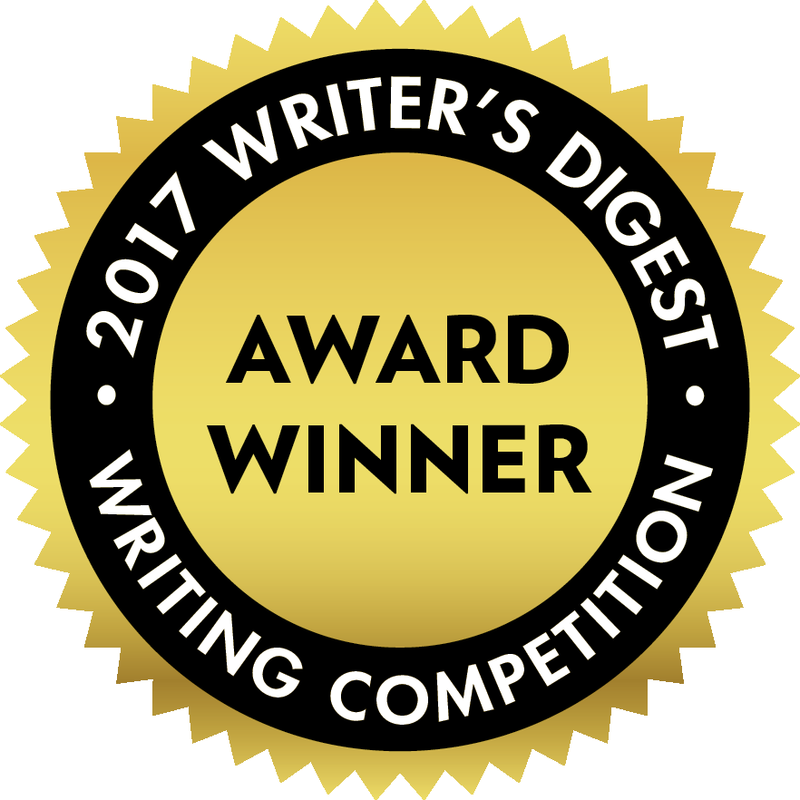 Many thanks like this post.Really this post like mirakkle.We are proud for like this post.I enjoyed one day after watching scrabble game solution scrabble word generator. IPad game takes forever to load, let's me play ONE game...then craps out!!! Even if there are people who don't Facebook to play Scrabble, such as myself, the network error continues with no known solution.